I wanted to get some photos of the wings of the Cockatoo to use in a computer art work for a celebration of Pentecost, so I put the telephoto lens on my camera and left it in the car hoping to see a flock of the birds. I prayed that God would help me to get a good shot.....but after about 3 months I took the camera out of the car. I had not seen them close enough and I was thinking that the camera I had was the wrong sort for catching the kind of images I wanted. Meanwhile I had also seen the images of two hands crossed in an iconic art work and they looked just like wings. 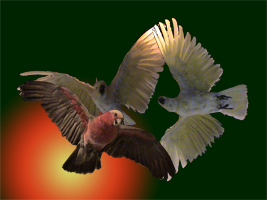 So I decided I would try and morph two hands into a dove ... the Holy Spirit is the "ezer" - "Helper" like two hands. I took the camera out of the car and that afternoon I heard a lot of squawking. It took me a few minutes to realize that there were cockatoos outside my house. I grabbed the camera and went outside. The cockatoos flew towards me, lifted their wings, (which was just the shot I wanted!!) and then flew away. How gracious God is! Christmas 2005 we visited Melbourne. I decided to go to the Museum. They had stuffed birds hanging from the ceiling ... I was able to use my digital camera to take the photos I had originally wanted. I put them together to make this one: The right images for my camera! 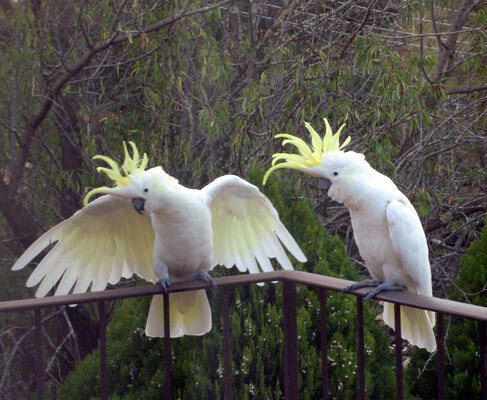 In 2007 two wild cockatoos came to my balcony and posed for me! So God answered my prayer.